McALLEN — An Edinburg man who slammed his SUV into a U.S. Border Patrol agent’s vehicle in an attempt to evade capture was sentenced to more than four years in federal prison. U.S. District Judge Micaela Alvarez sentenced Victor Eduardo Acevedo-Ventura to 50 months in federal prison Tuesday in connection with his attempt to transport undocumented immigrants and for intentionally crashing into an agent’s vehicle while attempting to escape. U.S. Federal Public Defender Miguel Nogueras, who represented Acevedo-Ventura during the hearing, argued for a punishment range within the recommended sentencing guideline for human trafficking charges, stating his client was a smart young man, who made a bad choice, and lacked guidance. But the government, represented by Assistant U.S. Attorney David A. Lindemuth, pushed back, asking the court to impose a higher punishment than the recommended maximum 41 months he was slated to receive, citing Acevedo’s reckless actions, the need to protect the safety of the community, and promotion of the rule of law. “He could’ve killed himself, or the agent,” Lindemuth stated. The agent who was attempting to pull over Acevedo-Ventura and who subsequently was struck by the man’s vehicle, was in court for the hearing. The agent, who did not report any injuries as a result of the crash, silently shook his head side to side as Nogueras argued for his client. The agent declined to provide an impact statement during the hearing. Prior to the judge handing down her sentence, Acevedo-Ventura, 24, apologized to the court, his family, and the agent he crashed into. He said he was glad the agent wasn’t hurt. 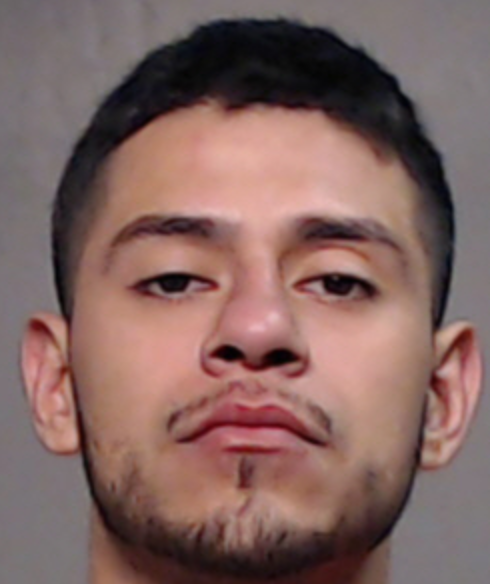 The Edinburg native, who was facing five charges against him; four counts of bringing in and harboring illegal aliens, and one count of assault, pleaded guilty to one count of assault, and one count of bringing in and harboring last December. Acevedo-Ventura was before the court Tuesday for the sentencing hearing related to his role in an attempt to smuggle six undocumented immigrants, and the subsequent assault of the agent, after the agent attempted to stop him. Acevedo-Ventura came to the attention of a Border Patrol agent on Oct. 24, 2017, as he drove north on Highway 281, according to the complaint filed against him. About a mile from the Falfurrias checkpoint, Acevedo-Ventura, driving a black Ford Expedition, he turned left on a turn-around, and began heading south, away from the checkpoint. The agent activated his emergency lights in an attempt to pull the man over after getting word from fellow agents in the Aerostat about three potential undocumented persons left in the brush near where Acevedo-Ventura had departed. “This is a common route of travel used by smugglers near the Falfurrias checkpoint, subsequent to dropping off undocumented aliens (UDA) to circumvent the checkpoint,” the complaint states. Moments later Acevedo-Ventura pulled his vehicle onto the shoulder of Highway 281, and the agent parked behind him, but only momentarily, before Acevedo-Ventura once again fled from the agent, the record states. “ The agent noticed the driver did not put the Expedition in park and shortly after, the driver sped away and the agent with his emergency lights still engaged, activated his sirens and pursued the Expedition,” the complaint states. As the agent followed, Acevedo-Ventura, who was driving in the left lane next to the agent who was in the adjacent lane, quickly slammed on his brakes, and crashed into the agent’s vehicle, specifically the driver’s side door, and the rear passenger door, the complaint states. “Moreover, the driver of the Expedition intentionally hit the agent’s unit once more in quick succession, this time hitting the rear passenger door behind the driver’s door, and the rear driver side quarter panel,” the record states. Eventually, Acevedo-Ventura’s Expedition spun around and came to a stop in the middle of the road, the complaint shows. During his interview with federal agents Acevedo-Ventura, who stated he became involved in human smuggling sometime in 2013, said he stole the Expedition from a friend, and was to be paid $400 for transporting some undocumented immigrants near the Falfurrias checkpoint. He also told agents that he didn’t intentionally crash into the agent’s vehicle, instead, he said he planned on pulling over, but then “freaked out,” and started going again. Acevedo-Ventura claimed he didn’t intentionally crash into the agent’s vehicle, and that it was an overcorrection as a result of trying to use his cellphone while driving. “He mentioned he got nervous and in an attempt to reach for his cell phone to call his mom, he swerved onto the side of the road, overcorrected and hit the police vehicle twice,” the complaint states. Shortly after his arrest, agents located three undocumented immigrants in the brush who confirmed that moments earlier they had been dropped off by Acevedo-Ventura. In addition to the more than four-year sentence, Acevedo-Ventura will also be required to serve three years of supervised release upon completion of his prison term. The government dismissed Acevedo-Ventura’s remaining three counts of harboring aliens, court records show.